Love the story your reclaimed barn wood furniture tells through each unique mark! 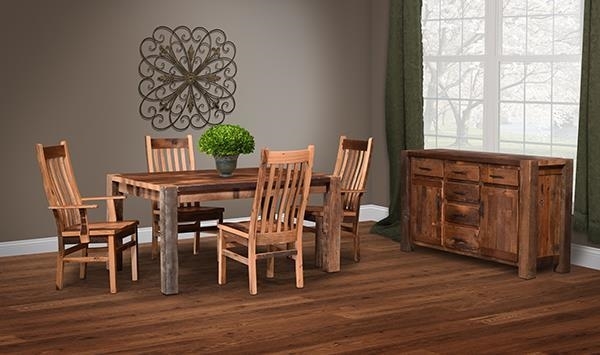 DutchCrafters is proud to carry a number of Eco-Friendly products made from century old reclaimed wood. Each piece of furniture is handcrafted from salvaged American barn wood and preserved to tell it's 100 year old history through the original knot holes, worm holes, sun spots and nail holes! Our Amish wood workers pay extra attention to detail preserving the unique personality in all the reclaimed wood furniture. Each piece made especially for you with a story to tell. The reclaimed wood is both locally sourced and made by our talented Amish craftsman creating truly Eco-Friendly furniture. As the 100 year old American Barns become stagnant, they are disassembled by hand, piece by piece to salvage as much of the wood as possible. Then sent through a vigorous cleaning process to get all the dirt off, remove the nails and kiln dried to 7% moisture. After the cleaning process, the reclaimed wood is ready to be handcrafted into beautiful, unique furniture for your home. Our reclaimed wood furniture collection is an excellent way to preserve the old and vintage and give the natural resource a second life!